Michael Schumacher outperformed Mercedes teammate Nico Rosberg in both practice sessions for the first time this season. (CNN) -- Red Bull bounced back to dominate the second practice session in Barcelona on Friday, while Michael Schumacher made an encouraging return to form ahead of Sunday's Spanish Grand Prix. McLaren's Lewis Hamilton and Jenson Button topped the timesheets for the first run, boosted by changes to their cars, but Sebastian Vettel became the only driver to break the one-minute-20-second barrier to set down a marker for Saturday's qualifying sessions. The German's time of 1:19.965 eclipsed the previous best of 1:20.175 set by Red Bull teammate Mark Webber, while Schumacher was third in his modified Mercedes, which now has a longer wheelbase, in 1:20.757. "We've got a few changes on our car, but I don't think anything as significant perhaps some of the other teams have," Vettel told the official F1 Web site. "There's a little bit everywhere on ours and I think we've proved today that our changes work. "I think the lap times are irrelevant from a Friday. It's good to be fast, but I think the McLarens are quick here -- I don't think they were pushing hard this afternoon and I think it will be much closer tomorrow." Seven-time world champion Schumacher was also third fastest in the morning, meaning the 41-year-old outperformed his younger teammate Nico Rosberg in both practice sessions for the first time in his comeback season. 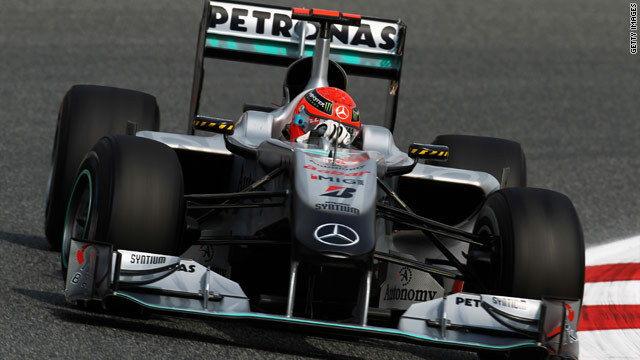 "Today I felt much more comfortable in the car and feel that it is behaving more consistently," Schumacher said. "In my view, our upgrade is a step forward but we have to wait and see how big the step is as the other teams have obviously improved as well. We will only have the real picture after qualifying tomorrow." Rosberg is second behind world champion Button in drivers' standings after four races, while Schumacher trails well back in 10th. The 24-year-old was sixth in the morning and then seventh behind Renault's Robert Kubica in the afternoon. Ferrari's Fernando Alonso was fourth fastest in the second runout while teammate Felipe Massa was seventh after an earlier 12th. Hamilton, the 2008 world champion, was fifth in the afternoon while Button was back in ninth. "I think we've still got a little bit of work to do, to be honest," the defending race champion Button told the F1 Web site. "I didn't get as much running done this morning as I would have liked because I hit something coming out of the pits -- probably a small part of a car, which damaged one of my car's bargeboards. "This afternoon we embarked on some set-up changes that we thought were headed in the right direction, but I'm not sure if they were." The new teams again trailed at the bottom, with the Lotus duo of Jarno Trulli and Heikki Kovalainen ahead of Virgin's Lucas di Grassi, HRT's Karun Chandhok and Bruno Senna . Timo Glock brought up the rear in a disappointing run, especially given that his Virgin has an extended fuel tank that should allow him to complete Sunday's race while Di Grassi's does not. The planned modifications to both cars were delayed due to the volcanic ash cloud that left the teams stranded in Shanghai for days after the Chinese Grand Prix last month.